Join Perkiomen Tours to visit the campus of the Seeing Eye Institute to learn about the world's oldest guide dog school, enjoy lunch at Stoney Brook Grille and experience a guided Campus and Town Tour of Princeton, NJ. Since 1929, The Seeing Eye, Inc. has helped people who are blind discover the exhilerating experience of traveling with a Seeing Eye dog. This program will include a presentation by an instructor with a Seeing Eye dog and a question and answer session with a Seeing Eye graduate. An included lunch will be enjoyed at the Stoney Brook Grille and will be followed by a private Campus and Town Tour of Princeton, NJ. We will visit the Seeing Eye Campus and learn more about the world's oldest guide dog school. 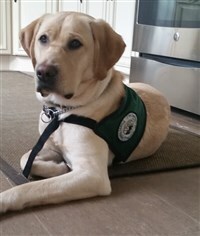 During this visit we will enjoy a presentation by an instructor with a Seeing Eye dog and a question and answer session with a Seeing Eye graduate. After lunch at Stoney Brook Grille (in North Branch, NJ) we will have a private Campus and Town Tour of Princeton, NJ. We will come directly home after the tour.